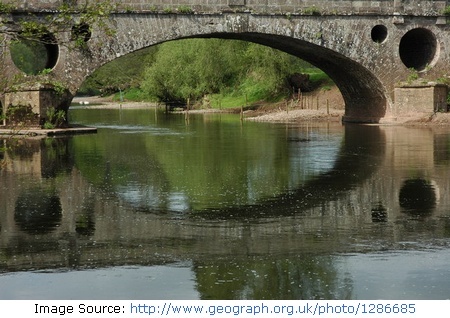 Pant-y-Goitre Bridge on the river Usk, near the village of Llanvihangel Gobion, Monmouthshire, Wales has a strange look because of holes in the spandrel (the triangular space between two arches). These holes are meant to reduce water pressure on the bridge during flooding. 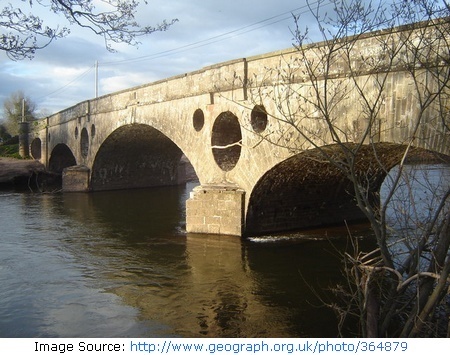 The bridge was reportedly designed by John Upton and was built around 1821. It has centre span of 17.7 metres (58 feet) and two side spans of 11.9 metres (39 feet) each. A search on Google didn't reveal any other bridge with such an ingenious design. It has withstood test of time and is perhaps unique bridge of its type. Few more bridges of this type can be seen at More "Bridges with Holes"
Source of Information: "The ancient bridges of Wales and western England by E Jervoise" as quoted in the book "Wales and west central England" by Roger Cragg (Google Link). © Copyright: Images from http://www.geograph.org.uk are under copyright of their owners and licensed for reuse under this Creative Commons Licence. 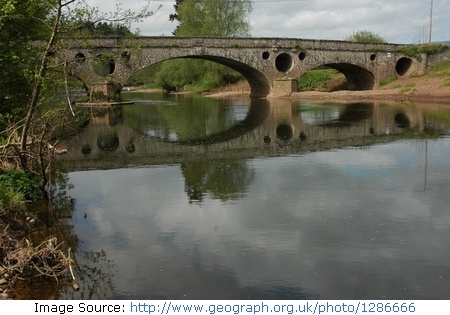 I have memories of an otter hunt taking place around the piers of this bridge, with the (fox) hounds rampaging from side to side of the river- seen as an 8 yr.old evacuee, billeted at Pant y Goitre; around 1940-41.I presume the hunt was requested by Mr.Birchenough to protect his Usk salmon. The hunt came from Llanviangel Gobion.